To answer this question, you first have to decide which variety of potatoes you are growing. There are three types, each with their own maturity time. Average maturity times apply under the correct growing conditions. Based on the name, you can tell these are going to mature faster. In 90 days, early potatoes are ready to harvest after seeding. For those of us who live in a cooler region, these are the best fit. If you are interested in this variety, look for King Harry, Caribe, and Red Norland, all of which are popular choices. A variety with a little longer maturity season are referred to as midseason potatoes. It takes, on average, 100 days to harvest. Gardeners who live in a warmer climate, such as USDA zones 6 or 7, could use these. Bernadette, Charlotte, Mona Lis and Rose of France are two midseason varieties. The last type of potatoes you can purchase are called late varieties. If you are looking to grow enough potatoes to last for an entire year, these are the types you want. Under the right conditions, late potatoes take 120 days to mature. They do better in regions with a longer, warmer season. Look for Caesar, Corne de Gatte, and Vitelotte. If you want to reach the average maturity time for the variety you select, you want to start off the process of growing potatoes correctly. It is best if you use certified tubers purchased from a local nursery. While you could grow potatoes from those bought in stores, supermarkets treat them to avoid sprouts. Certified tubers are stronger and resist diseases easier. Another tip to get the best maturity time is to start your tubers indoors. You could put tubers right into the ground, but better results come if you wait for them to sprout indoors. Potatoes take five weeks to sp﻿r﻿out if left in a space that is warm and well-light. Doing this can reduce the harvest time by a whole month! We can’t control the weather, but we can control the conditions of the ground we plant our potatoes. Tubers prefer well-draining soil that is at least 40 degrees F.
If the ground is too soggy from lack of drainage, the tubers can rot. 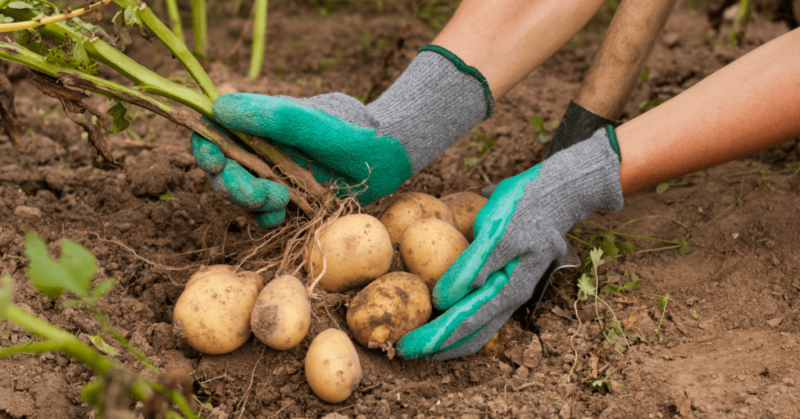 For this reason, many gardeners opt to use things such as raised beds or even tires when growing their potatoes. Potatoes need fertilizer. The average recommendation is to apply some as you plant them into the ground. Then, apply another dose of fertilizer halfway through the growing season. You should also add in organic matter or ﻿﻿﻿compost before planting the seed potatoes. Another great tip for improving the conditions for potatoes is to apply a layer of mulch. Mulch serves many purposes. It helps to retain moisture in the soil, reduces weeds and adds nutrients back into the soil as it decomposes. Shredded leaves and straw are two popular options and relatively inexpensive. What if Potatoes are Delayed? There are times when potatoes may take longer to grow than you anticipated. Slow to grow potatoes happen, typically, because of improper soil conditions. If the soil is too wet, cold or dry, they won’t grow as they should. If you left the soil too dry after planting, seed potatoes dehydrate easily. 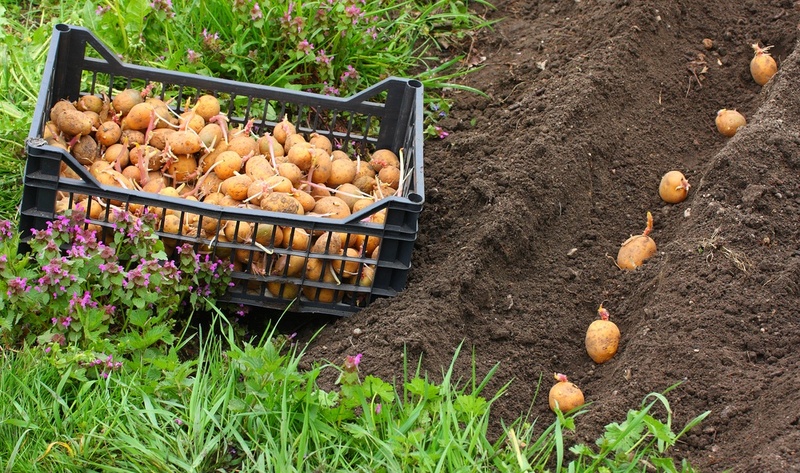 If the starting temperature of the soil is too low, seed potatoes may wait to grow or rot. You can see a short video here about potato blight. Diseases can also delay growth and harvest of potatoes. 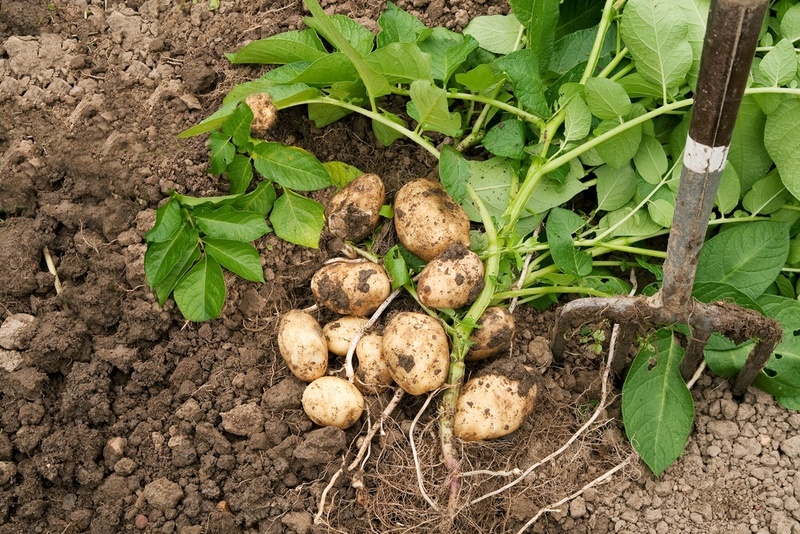 Potatoes are prone to diseases and pests such as flea beetles, leafhoppers, potato scab, and aphids. You can use an insecticide or use organic methods to get rid of diseases. For example, you can get rid of potato bugs by using traps or a natural, anti-microbial solution. Remember also to ﻿﻿weed ﻿﻿the area the best that you can. Debris and ﻿weeds ﻿could lead to diseases and pests. If you are wondering how long does it take to grow potatoes, the answer mainly depends on the variety you grow. They can mature anywhere from 70 to 120 days. You should select a variety that will do well in your USDA hardiness zone and climate. 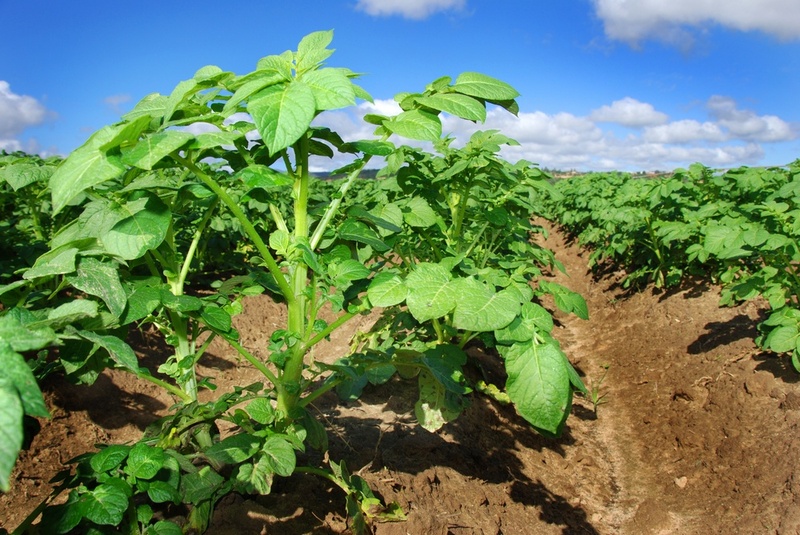 Delayed growth will extend the growing season for potatoes. If you take care to start seed potatoes indoors and provide the right conditions, you can expect a harvest at the listed time. Now that you know, it is time to start planning! What is your experience growing potatoes? Let us know in the comments! Remember to share if you found this helpful.